Your website is your #1 Marketing Asset and #1 Sales Person. It’s your first impression to potential buyers. 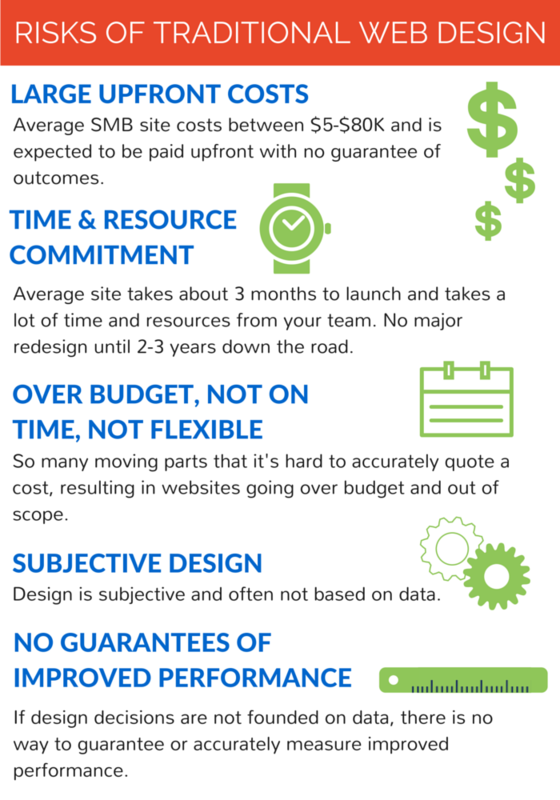 For something that holds such significant value, it makes sense why so many companies stress out over building the perfect site. But therein lies the problem: The traditional model of website design is broken. Enter the modern approach to web design: Growth-Driven Design. Growth-Driven Design (GDD) is a new approach to building a high performance website that is founded on data and analytics and designed with specific goals for improvement. It’s taking the traditional model of web design and flipping it on its’ head. We will dive deeper into what exactly Growth-Driven Design is, but first, let’s take a look at some of the major reasons that GDD was formed in the first place. Large, costly, time-consuming, and frustrating web projects have run their course. GDD is born from a realization that the traditional model of website design is broken. GDD is created from a need to eliminate the risks that come with website design. Instead of launching a new site every couple of years, GDD creates a site that is constantly improved upon in conjunction with inbound marketing and sales efforts. As the chart below demonstrates, the impact of the GDD approach is far greater than traditional web design. GDD minimizes the risks associated with traditional web design. Through continuous research and observation of website visitors and their behaviors, we can better guide ongoing improvements and improve performance. GDD is tightly integrated with both marketing and sales, which allows all team members to be aware of what works and what doesn’t and devise strategies for improvement as a team. Whether starting a web project from scratch or working to make ongoing improvements to an existing site, the process is the same. It starts with a website audit, outline of goals, and development of strategies for ongoing improvement. 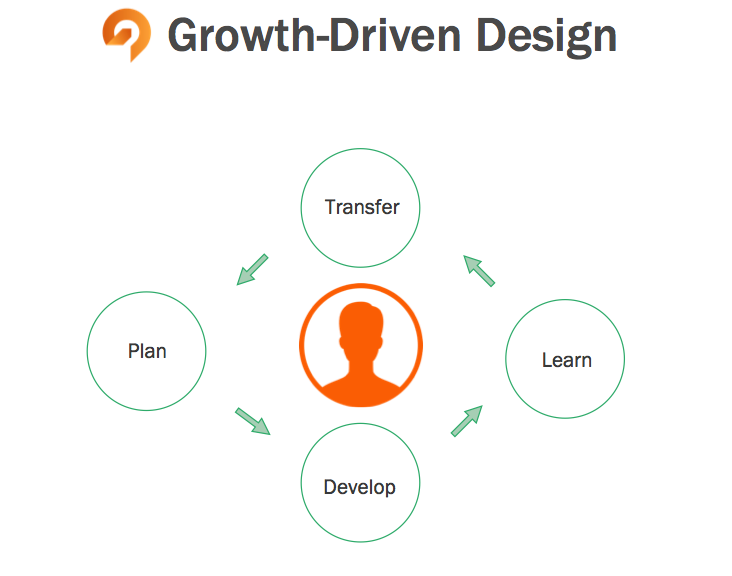 Phase 1 can be considered the kick-off of the Growth-Driven Design campaign. This is where all the research needed to create specific action items and goals is collected. Phase 1 generally takes about 1 month, but the initial, or launchpad, site is being implemented during this period. Let’s take a look at some of the research that should be collected during Phase 1. Quantitative Research: This is research found through performing an audit of the existing website to find key performance indicators that need improvement, such as: where users drop off, what is and is not working, traffic patterns, site speed, etc. Qualitative Research: This research is all about the user experience: their behaviors, what they like and don’t like about the site, what they are looking for, etc. Persona Research & Development: Also during Phase 1, we create detailed buyer personas of the various groups that will visit the site. This helps guide goal development based on what the key buyer personas are looking for from your site. If you are working with your marketing and sales agency on Growth-Driven Design, these personas should already exist and will be ingrained in your GDD team’s minds. Goals: Armed with all of this great information, the GDD team works with you to come up with goals that should be achieved. What would we like to improve? What areas of the site are not performing well and are missed opportunities? How will our plans for improvement affect the overall goals of marketing and sales? After exhaustive research, strategy and goal planning, and brainstorming from all team members, the Growth-Driven Design Cycle can begin. 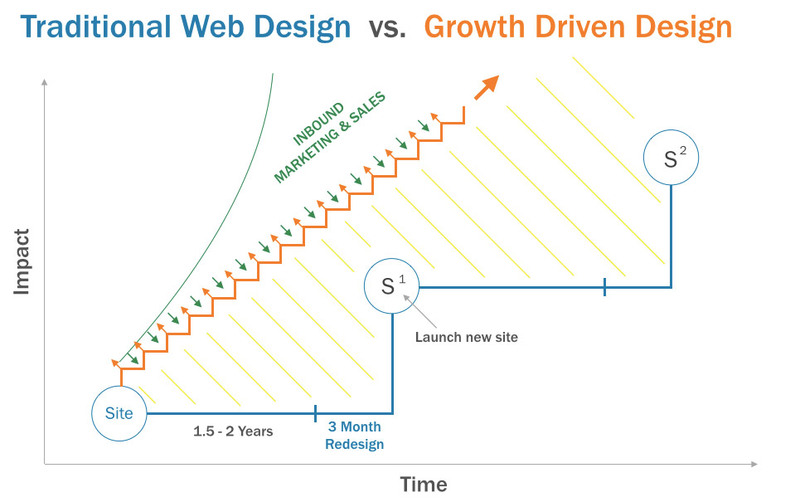 As we mentioned before, whether you start with a brand new site or apply changes to an existing one, the Growth-Driven Design Cycle is what it’s all about. Phase 2 is made up of the ongoing improvements that are made on a monthly basis over the course of the year. Quite simply, the Develop step is where all of the plans from Step 1 come together and are put into action. This is where the action items that were implemented are analyzed to see if they produced the intended results. The results gathered in Step 3 will help guide the next GDD cycle. In the last step of the GDD Cycle, the valuable information gathered is transferred to other areas of the business. What can other departments learn from your observations? How will the results affect marketing’s plans for next month’s campaign? All of these questions matter, because Growth-Driven Design has an impact on the entire business. As marketers and salespeople, we strive to be at the forefront of innovation and find new ways to grow our businesses. Growth-Driven Design is transforming the way we approach website design. Through continual research and improvements, Growth-Driven Design gives us a leg-up on the competition. Instead of a new website every 2-3 years, GDD creates a refreshed site monthly and is always on the cutting edge of new design, proven results, and informed decisions that guide the business as a whole. Get on board with the latest innovation in web design, save yourself a lot of headaches and frustration, and grow your business in new ways. Contact us for a consultation and we’ll walk through the ways Growth-Driven Design can improve your website and your business!